Register now and you can still get the early-bird rate. You will also be in time for the bonus concert (Bob Florence Limited Edition 40th Anniversary Reunion) and you will receive priority seating. You're also eligible for the early bird price for the Sunday Brunch. We're returning to the Westin-LAX which has a very nice ballroom and an actual theater for our panels and films. The three day schedule is correct, but we will offer the same number of concerts with a slightly tighter schedule than usual. Plan on 7-8 concerts per day with the bonus concert taking place during that period. Most of the bands are confirmed but we will be adding a few more in the near future. Los Angeles is home to many of the greatest big bands, composers, arrangers and jazz soloists in the world and we feel it's important to continue these events so they have an opportunity to be heard by an appreciative audience! Alumni of the Limited Edition come together for this very special concert presenting Bob Florenceâ? ?s brilliant compositions and arrangements from the entire lifetime of the band. featuring the original Rob McConnell arrangements from Canadaâ? ?s finest. Jack Goodwin donates his priceless Warne Marsh Collection! In addition to producing a number of live jazz events throughout the year, The Los Angeles Jazz Institute is the largest jazz archive and research center on the west coast and one of the largest and most comprehensive in the world. The Los Angeles Jazz Institute is a 501c3, tax exempt, public benefit corporation. All donations are tax-deductible. Currently there are 4 "members only" CDs to choose from. Quanities are extremely limited. features unissued radio broadcasts of the 1957 All Stars live from the Lighthouse. These broadcasts come from a short lived Los Angeles radio program called Nightlife that aired on KMLA on Wednesday nights at 11:30. This edition of the All-Stars featured Conte Candoli, Bob Cooper, Frank Rosolino, Victor Feldman, Howard Rumsey and Stan Levey. Chet Baker, Ascent of the Cool features rare and unissued recordings that document Chet's early years on the west coast. 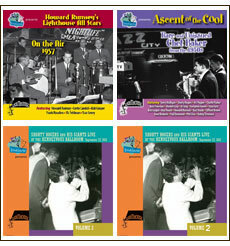 These recordings come from a variety of sources all of which are part of the Los Angeles Jazz Institute archive. The recording quality varies from track to track but the historical importance makes up for whatever flaws may exist. The sessions range from Chet's first known recording in 1949 to an appearance on the Stars of Jazz Television program in 1956. We've programmed the disc in chronological order which creates a fascinating listening experience. We hear Chet grow from a 19 year old trumpet player who is just beginning to find his way around the horn, to a full fledged jazz giant fully in command of his instrument. LAJI 007 Shorty Rogers, Art Pepper, Wardell Gray, Gerry Mulligan, Chet Baker, Bob Enevoldsen, Hampton Hawes, Joe Mondragon, Lawrence Marable and June Christy. 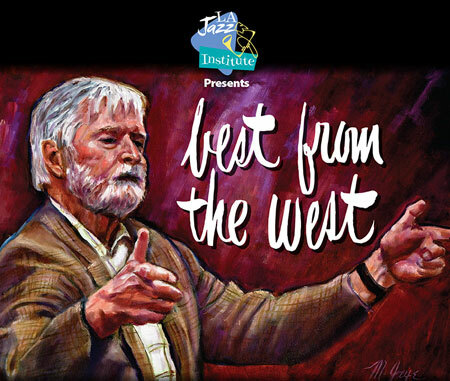 An unprecended gathering jazz stars captured live at the beginning of the west coast jazz movement. LAJI006 Shorty Rogers, Art Pepper, Wardell Gray, Gerry Mulligan, Chet Baker, Bob Enevoldsen, Hampton Hawes, Joe Mondragon, Lawrence Marable and June Christy. Our mission is to collect and preserve jazz materials and make them accessible to scholars, students, researchers and the jazz community. To accomplish this, we actively acquire new materials and continue to seek out important private collections. We also provide a setting where musicians and their estates can donate or loan their materials with the assurance that they will be preserved for future generations. One of the things that makes the LAJI unique is that we actively use the materials in the Archive by maintaining a busy schedule of outreach activities including concerts, festivals, broadcasts, publications and the release of important recordings on compact disc. Member support along with private and corporate gifts play a vital role in keeping the Jazz Institute alive. Please consider becoming a member today.